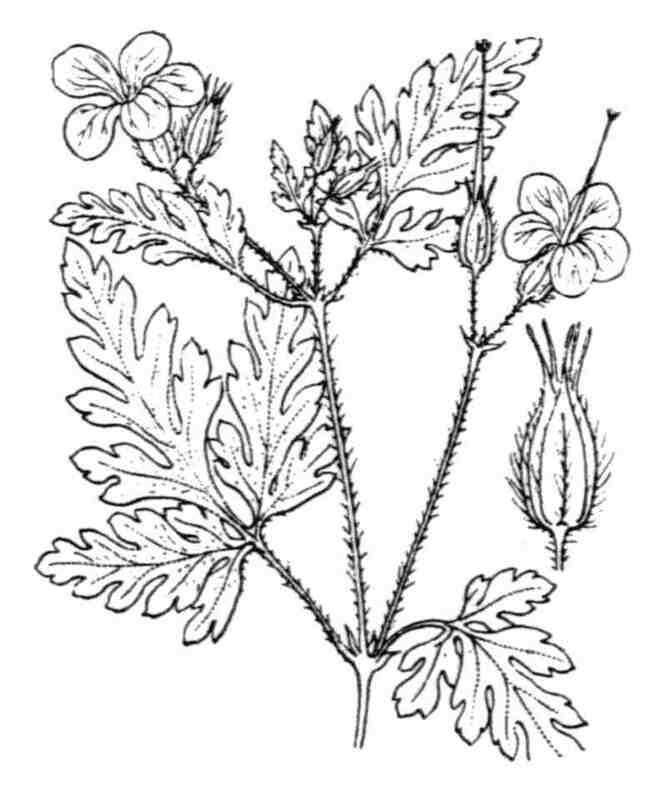 LATIN: Geranium robertianum subsp. robertianum L.
Geranium robertianum subsp. robertianum L.
Plante annuelle ou bisannuelle, polymorphe, velue-glanduleuse, souvent rougeâtre, à odeur fétide [pas fiable]; tiges de 10-50 cm, fragiles. Répartition hors de France : Europe; Asie occidentale; Afrique et Amérique septentrionales. A small, unpleasantly scented, hairy annual 10-23 cm high.. Stem erect, little branched, hairy. Often flushed with red. Flowering UK: Early June-mid Sept.
Leaves: hairy, lower with 5-7 cuneiform, deeply and acutely-toothed lobes. Fruit: carpels transversely wrinkled; seed 2.5 x 1.7 mm, ovoid, smooth, brown.